1. Why does West Point need private support? 2. How do federal tax dollars and donor gift funds interrelate? 3. How much is raised in a fiscal year and for what purposes? 4. Is my gift tax deductible? & What’s the WPAOG tax ID number? 5. What is the difference between the Superintendent’s Annual Fund & the Superintendent’s Endowment? 6. What is the difference between the Long Gray Line Fund, & the Long Gray Line Endowment? 7. What are the Superintendent’s Circle, and the Chairman's Circle? 8. What is the ‘A’ Club? 9. What is the West Point Parents Fund? 10. What is the Class Gift Fund? 11. What’s the difference between a fund and an endowment? 12. How do I restrict a gift? 13. What gifts count towards the Annual Giving Clubs? 14. What gifts count towards the Lifetime Giving Societies? 15. I heard that a surcharge is applied to gifts made to West Point through the West Point Association of Graduates. Why? 16. What are the primary sources of private funds? 17. Why do I get solicited so many times? 18. When does my gift reach the USMA or WPAOG designation? 19. Do the callers that call on behalf of the Academy work on commission? 20. Read the entire Gift Acceptance Policy document. The WPAOG Memorandum of Understanding with USMA states that WPAOG will raise money for USMA needs "for which appropriated money is not available and is unlikely to become available." The Academy's private funding needs continue to grow substantially due to rising educational costs and decreasing federal funding. 4. Is my gift tax deductible? West Point Association of Graduates (WPAOG) is a tax-exempt organization incorporated under the laws of the State of New York. WPAOG is officially listed in the IRS Cumulative list of Exempt Organizations (IRS Publication 78) as an organization qualified for maximum deductibility. Gifts to WPAOG receive all of the income tax and estate tax benefits allowable under the law. The official title of WPAOG in the IRS Publication is "Association of Graduates of the United States Military Academy, West Point, New York." Its Federal Identification Number is 14-1260763. 5. What is the difference between The Superintendent’s Annual Fund, Superintendent’s Endowment? Alumni can designate their gifts to any Academy need that has been approved by the Superintendent. Gifts to the Superintendent’s Annual Fund are unrestricted gifts for West Point. The Superintendent receives requests from all of the major activities at the United States Military Academy for additional funding to support Margin of Excellence needs. Gifts to the Superintendent's Annual Fund are arguably the most important gifts the Academy receives because they are used to "fill in the gaps" and fund urgent, current needs. Gifts to the Superintendent’s Endowment allow the Superintendent to plan for and allocate funds from a constant and reliable source, rather than depending on the fluctuation of year-to-year fundraising efforts. The annual interest generated by the principal of the Superintendent’s Endowment will provide a dependable source of funds that will help sustain West Point’s Margin of Excellence programs in perpetuity. 6. What's the difference between the Long Gray Line Fund and the Long Gray Line Endowment? Gifts to the Long Gray Line Fund provide valuable operational support for the WPAOG by funding existing programs for alumni and the Corps of Cadets. They enable the WPAOG to provide world-class alumni services, take advantage of advances in information technology to improve the speed and quality of communications with members, and enhance services to graduates around the world. Gifts to this fund are utilized for current use. Gifts to the Long Gray Line Endowment support the same programs and services made possible through gifts to the Long Gray Line Fund. The annual interest generated by the principal of the Long Gray Line Endowment will help WPAOG realize its vision of becoming the premier alumni organization in the nation. 7. What are the Superintendent's Circle and the Chairman's Circle? The Superintendent’s Circle is a recognition program that acknowledges graduates, parents, and friends who believe in and make yearly gifts of $1,000 or more to the Superintendent’s Annual Fund, Superintendent’s Endowment, or West Point Parents Fund within the calendar year (Jan 1 – Dec 31). The Chairman’s Circle is a recognition program that acknowledges graduates, parents, and friends who believe in and make yearly gifts of $1,000 or more to the Long Gray Line Fund or Long Gray Line Endowment within the calendar year (Jan 1 – Dec 31). Gifts to the Army "A" Club support Army's intercollegiate athletic teams. Each spring, graduates, parents and friends of West Point are asked join the “A” Club. 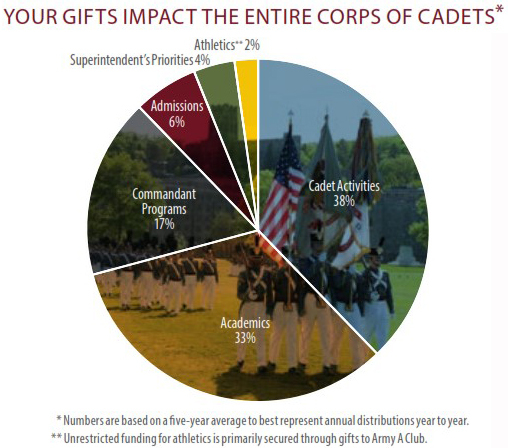 Unless the donor restricts the gift to a specific team, donations will support all corps squad athletics. 9. What is the West Point Parents Fund support? The West Point Parents Fund is a subset of the Superintendent’s Annual Fund. This annual appeal is sent to parents of current cadets to obtain valuable unrestricted support for West Point. The Class Gift Fund is a tangible account where funds designated to a particular class reside until the class presents a gift to a chosen Academy need. Gifts made to the Class Gift Fund are not disbursed to the Academy for immediate use, but remain in the fund until the class directs a transfer to the Academy at their reunion. A fund provides the means for donors to make gifts to West Point and for those dollars to have an immediate impact on the institution’s greatest needs. An endowment is comprised of donations to an institution with the stipulation that the gift be invested and the principal remain intact. A portion of the interest is spent every year and the rest is reinvested to compensate for inflation and recessions in future years. Gifts to an endowment continue to grow over time and provide a constant, reliable source of income. A combination of current-use dollars (annual fund) and long-term investment (endowment) allows West Point to manage both short- and long-term needs effectively. To restrict your gift, send us a note along with your check and designate what you would like your gift to support (i.e., your Class Gift Fund, Cadet Activities, or the Superintendent's Annual Fund), or simply write the name of the account in the memo line of your check. The annual total of all contributions to West Point received between 1 January and 31 December of each preceding year determines membership in the new gift clubs or councils. Corporate matching gifts are encouraged and count toward club membership. Gift Council and Club membership must be renewed each year with a contribution. Total annual contributions will be recognized by membership in the club or councils as described here. The total of all gifts received during a donor's lifetime determines membership in the new giving societies. Corporate matching gifts count toward society membership. Total lifetime giving will be recognized by society membership as described here. 15. I heard that a surcharge is applied to gifts made to West Point through West Point Association of Graduates. Why? The WPAOG Development Office functions as the Academy's fundraising arm because military personnel and representatives of the federal government are prohibited by law from soliciting funds, goods, or services. Because federal government agents are forbidden from soliciting gifts, USMA has elected to reinvest a portion of all gifts in WPAOG Development. The exact fees assessed on gifts made through WPAOG are determined by a Memorandum of Agreement (MOA) between the Superintendent of the Academy and the Chairman of the Association. This MOA is reviewed annually. It is important to understand that 100% of your gifts directly benefit West Point. In an effort to operate even more efficiently and to get more donor dollars to the activity that a donor wishes to support, a new memorandum of agreement has been signed by West Point and WPAOG that lowers the gift allocation percentage on each gift from 15% to 12% effective January 1, 2011. The average non-profit takes between 15% to 24% of each gift for operations. The Development Office at West Point Association of Graduates differs from those of other higher educational institutions. The foundations of many other colleges and universities fall under the institution itself and are funded by the institutional budget. In these cases, the fees do indeed exist, often at much higher percentages than at West Point. However, they are not always transparent. The gift assessment is not a payment from individuals, classes, corporations, or foundations to WPAOG Development in exchange for services, but an investment mandated by USMA to ensure future fund raising success for the Academy. The gift assessment does not constitute a quid pro quo agreement between an individual, class, corporation, or foundation and WPAOG. All non-for-profit organizations must bear the costs of raising funds. Solicitations for the Superintendent’s Annual Fund and Long Gray Line Fund are mailed throughout the year. In addition, the Army Athletic Association sends out the “A” Club packet every spring. Donors can designate their gifts to support other approved Academy needs such as your Class Gift Fund. If your class is in a campaign, you will receive the letters that your committee members decide to send to you. If you were involved in a corps squad team, you might receive solicitations through the Army Athletic Association. As per our agreement with USMA, the WPAOG proffers all gifts of the previous year, the “Annual Distribution”, each May or June. Any gift that is needed prior to the next Annual Distribution will be proffered “out of cycle”. No, the firm that calls on our behalf, Catapult Fundraising, consists of salaried professionals. Although we establish goals, our contract with Catapult Fundraising is based on how many people we want them to solicit on behalf of West Point - not how much money they raise for West Point.